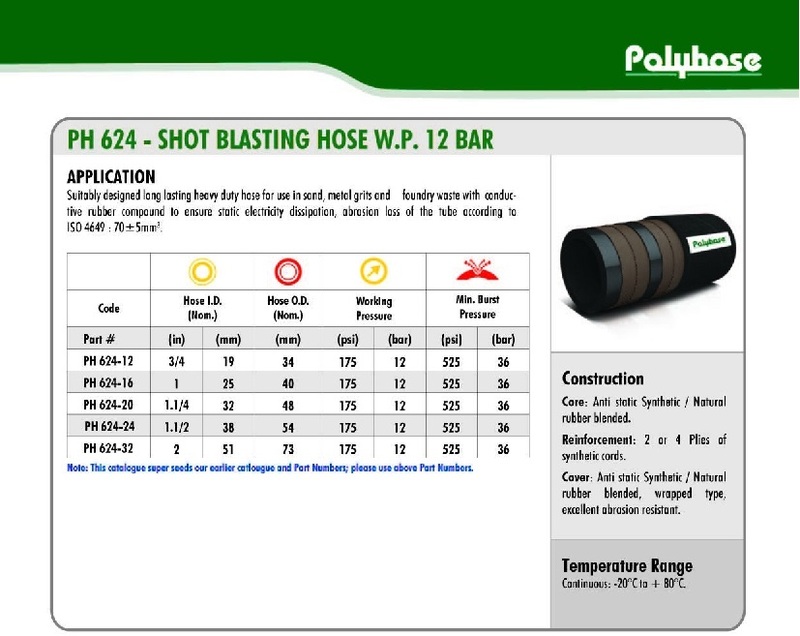 Short Description : LARGE BORE INDUSTRIAL HOSE PH624 SHOT BLASTING HOSE W/P.12 BAR Application: Suitably designed long lasting heavy duty hose for use in sand, metal grits and foundry waste with conductive rubber compound to ensure static electricity dissipation, abrasion loss of the tube according to ISO 4649: 50 ?5mm3. Construction: Core: Anti static Synthetic / Natural rubber blended. Reinforcement: 2 or 4 Plies of synthetic cords. Cover: Anti static Synthetic / Natural rubber blended, wrapped type, excellent abrasion resistant. Temperature Range: Continuous: -20?C to +80?C. Application: Suitably designed long lasting heavy duty hose for use in sand, metal grits and foundry waste with conductive rubber compound to ensure static electricity dissipation, abrasion loss of the tube according to ISO 4649: 50 ±5mm3. Temperature Range: Continuous: -20°C to +80°C.